Phoebe English is always a designer of exploration, yet the exploration is never far away from reality. English's menswear for Autumn/Winter 2017 is rooted in practicality and saw a range of workwear redefined. Inspired by the men English knows personally, the collection held focus on functional separates - loose coats, hooded jackets, smart folding collars and buttoned shirts amongst a range of relaxed joggers and wide fitted trousers. 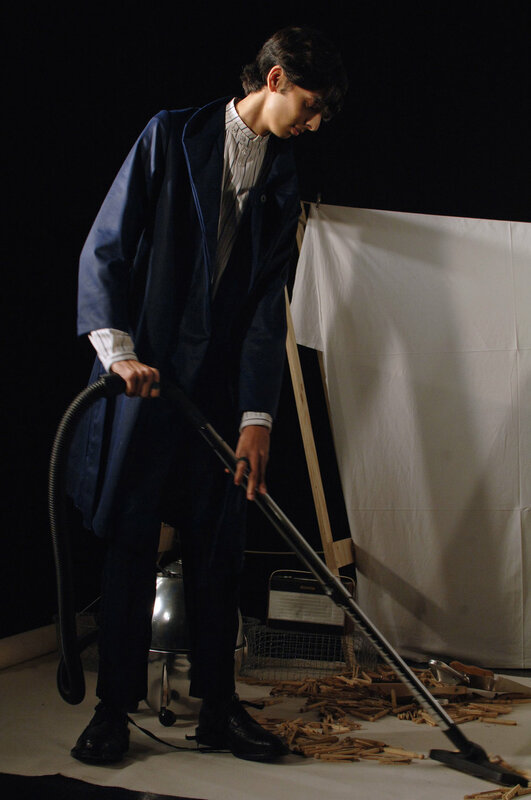 The male models stood in ranging places, all carrying out menial working tasks. 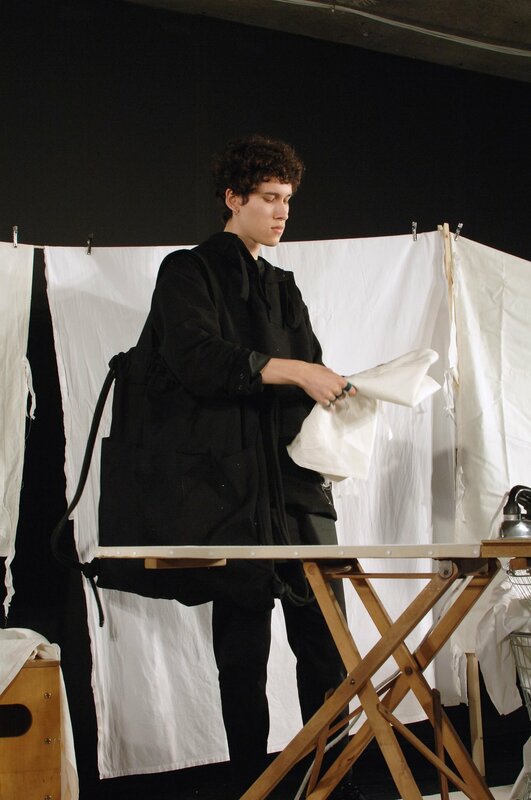 The audience saw a model sweeping the floor, a model ironing, a model folding sheets, and a model washing. A commentary perhaps on the clothes and their ethos of accessibility and relaxation. A man of any skill can wear this for ease, and for secured style. Entirely made in the UK, the collection oozes effortless sophistication. The colour palette of dark greens and bright navys gave the collection a focus on colouring and silhouettes of practicality. 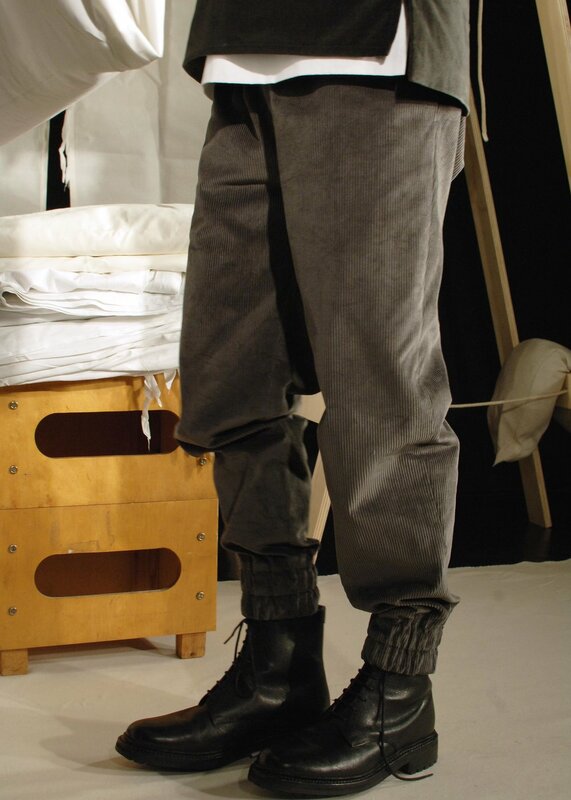 The colours and fabrics, which included velvet, corduroy, waxed cottons and vertically striped soft ticking told English's viewer that these clothes were made for wearing in multiple ways. Subtle, but still exquisite. English has created a collection of ease and comfort, but above all knowledge.